9:00 am-10:30 am - First Class Free - $12 Suggested Donation thereafter. A Quiet Place in a Chaotic World is Waiting Inside. 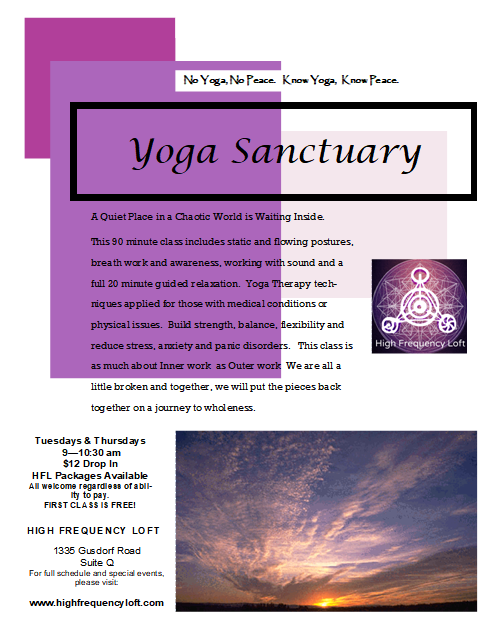 This 90 minute class includes static and flowing postures, breath work and awareness, working with sound and a full 20 minute guided relaxation. Yoga Therapy techniques applied for those with medical conditions or physical issues. Build strength, balance, flexibility and reduce stress, anxiety and panic disorders. This class is as much about Inner work as Outer work. We are all a little broken and together, we will put the pieces back together on a journey to wholeness.